Although this area has dramatically evolved with business technology, regular visits to the client's business and the sharing of information and ideas is still an integral and valuable part of the accounting profession. This includes full-charge bookkeeping services, including general journal and subsidiary ledger maintenance, bank statement reconciliation, and receivables and payables tracking and analysis. We can prepare expert cash flow and budgeting analyses that can help you minimize cost overruns, lost purchase discounts, and uncollectable receivables. Many of our clients state that these value-added services are indispensable. Many clients still prefer us to summarize their cash receipts and disursements. We use client write-up techniques and state-of -the-art software which accomplish this task in a cost efficient manner. We offer complete payroll preparation and payroll tax reporting services. We prepare all federal and state returns and can also assist companies and individuals in resolving payroll tax delinquencies with the IRS. 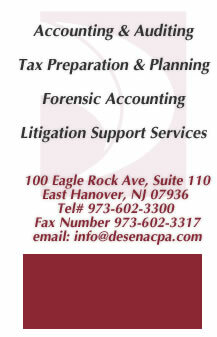 Our firm also prepares all sales tax filings and offers full sales tax audit representation.